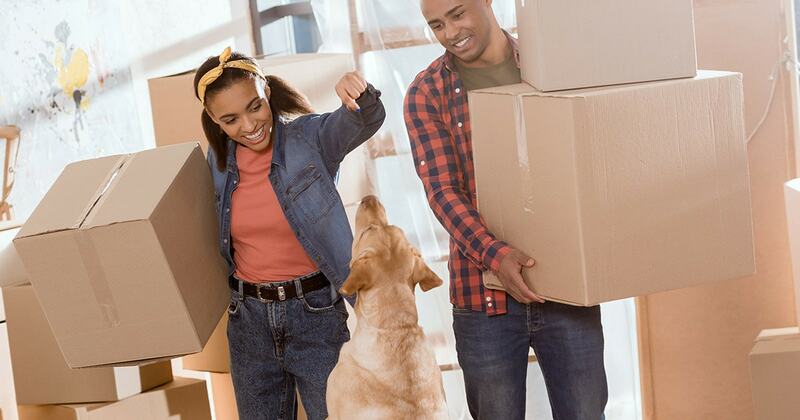 As you start prepping to move from your current residence to your new one, include your pets in the process since these family members tend to like familiarity. To minimize their stress levels and maximize their comfort in the face of this big change, here are some things to keep in mind as you make the big move. Bring in packing materials, boxes, moving blankets, etc., ahead of time so pets will get used to them being around. Also, pack a little at a time, if your schedule allows, so that any changes to your pet’s current environment are gradual. Some pets may need to be crated for the move. In this case, put the carrier in a favored spot or small, cozy room before the actual move date. Place a favorite blanket or toy in the crate and make it a comfortable place for them to be. This way, pets have a chance to explore and get used to the carrier before they have to ride in it. As your moving date nears, make a trial run. Take your pet for a short ride with them in the crate. Reward pets for the time they spend in the crate with treats and extra cuddles afterward. Next, make sure your pets are current on vaccinations and that all of their latest health information is in order, including rabies certificates, if necessary. Also, update any information for microchips and on ID tags. Any prescriptions your pet needs should also be filled ahead of time, particularly if you are moving to a new area. For pet owners moving to a new state, there may also be specific requirements you need to be aware of. To keep your pets calm, comfortable, and safe, set up their preferred space with familiar toys, beds, blankets, and food while you clear out the rest of your rooms. This will prevent them from being underfoot. Alternatively, see if they can stay with a trusted friend or family member or board them with a pet daycare facility for the day. Whatever you decide to do, try to keep to their routine as much as possible on moving day. You may also want to consider a professional pet moving service. For relocations that involve a long distance, transporting your pet by air might be a better option. Organizations like the International Pet and Animal Transportation Association can help you find the resources you need. Once you’re in your new home, introduce your pets to the space gradually. Pick a smaller, comfortable room to keep them in, along with their favorite things. As they get acclimated, let them out to explore for part of the day before shutting them back in the room. Lengthen the amount of time they are free-range each day until you eventually just leave the door open. For cats, when relocating litter boxes, move them gradually, one foot at a time, until they are in their permanent spot. For dogs, take frequent walks so they can become familiar with your new neighborhood and know how to get home. Giving your pets time to get used to and find their place within their new home will make the adjustment easier on your entire family.